Updates to Jerry's profile since your last visit are highlighted in yellow. I spent too much time skipping school days and classes. We had fun on Friday nights driving the Renton loop and hanging out at Dag’s drive in. Remember the Renton, Rainier, and Roxy theaters? Oh yeah, can’t forget the El Rancho. Those were the good old days! I worked for the Boeing Airplane Company for forty years and retired in 2009. I spend the winters at our home in Palm Springs, CA, and summers at our home in Winthrop, WA. I have recently completed my second book titled Boom Towns & Relic Hunters of Washington State....Exploring Washington's Historic Ghost Towns & Mining Camps. My book keeps me busy with radio interviews, TV appearances, book signings, and speaking engagements. My book can be purchased through Costco, Barnes & Noble, Amazon.com, most bookstores, and on my website at www.GhostTownsUSA.com. When I manage to have some free time I enjoy treasure hunting, fishing, hunting, exploring, hiking, and occasionally some golf. Jerry Smith has a birthday today. 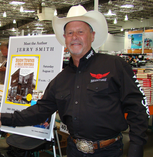 Jerry Smith updated his profile. View. Jerry Smith changed his profile picture.